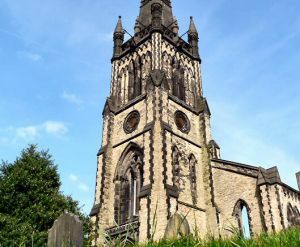 Christ Church is composed of the remnants of a mid-Victorian church, just north of Stockport. It was built in 1846 by architect William Hayley in Victorian Gothic, emulating Early English style. Hayley designed a large church of yellow sandstone, composed of a nave, aisles, transepts, chancel, west tower and spire beneath a roof of Welsh slate. Christ Church was badly damaged by a fire in 1977, and everything but the tower and a small section of the nave walls had to be pulled down. The tower is still full of interest, though; it is an excellent example of Victorian Gothic design, beautifully decorated with Early English windows featuring plate tracery. The tower rises in 4 stages to a recessed spire that has a distinct twist to it if viewed from the right angle. Apart from short sections of the north and south walls of the nave, the rest of the church layout can be seen as foundation walls. The tower is a wonderful landmark, perhaps best viewed from Stockport rail station. Christ Church has been in the care of the Churches Conservation Trust since 1979.